The BJP has asked the Delhi government to withdraw the 24 per cent hike in the power tariff and the 8 per cent surcharge, saying that all the three power distribution companies are earning profits of thousands of crores of rupees. Chief Minister Sheila Dikshit flagged off woman special buses of the DTC with an idea to provide safe and comfortable journey. The buses will be operated from the different parts of the city. 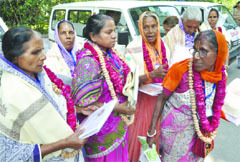 The Vrindavan widows whose morning starts with religious recitals amidst hopes for a better day ahead had a hearty time today in the national Capital where Sulabh International felicitated them in a step forward to its welfare measures after the monthly support of Rs 1,000 it announced in August, this year. The fifth Airtel Delhi Half Marathon 2012 will witness participants not only from the field of athletics but also from a varied background, including ex-army officials. Many war-disabled personnel of the Indian Army have registered for participating in the event that will be flagged off on September 30. The alertness of three taxi drivers helped the Delhi police nab a foreign national, suspected to be from Nigeria, in the Paharganj side of New Delhi Railway Station, after he was found dumping a bag with suspicious material today. Officials of the special cell, Delhi police, have busted an international drugs ring and apprehended two drug traffickers. They seized 8 kg heroin worth Rs 20 crore in the international market. Information was received that heroin was being smuggled into India from across the Indo-Pak border and brought for sale in Delhi as well as in Mumbai. A 24-year-old Delhi Transport Corporation (DTC) bus conductor allegedly hanged himself inside a bus at Netaji Subhash Place in north-west Delhi, today. A motorcyclist was crushed to death under a truck that turned turtle in the Dwarka area around midnight today. Two persons have been arrested for allegedly stealing cars by sedating the drivers, said police officials of the north-west district today. Chief of the Delhi unit of the BJP Vijender Gupta has said following large-scale protests against the hike, the government has now proposed a change in the consumption slabs already implemented by the Delhi Electricity Regulatory Commission (DERC). "But changing the slabs is not the solution. The government should withdraw the hike in power tariff," Gupta said. The DERC has authorised the distribution companies to charge tariff at the rate of Rs 3.70 per unit for consumption up to 200 units, Rs 4.8 per unit for consumption from 0 to 400 units and Rs 6.40 per unit for consumption of more than 400 units. The BJP has demanded that the hike should be immediately withdrawn in view of a price spiral and the accounts of the three power companies be audited by the Comptroller and Auditor General (CAG) of India so that manipulation in the accounts could be detected. The Delhi Cabinet had decided that the accounts of the power companies would be audited by the CAG, but this was not done, he added. The Chief Minister said that the number of buses under this service would be enhanced in accordance with the requirement of commuters in due course of time and hoped that this service would be patronised at large. Transport Minister Ramakant Goswami said that with a safety view, women conductors have been deployed in these buses. The buses will be operated from 11 points in the morning and evening. DTC officials have been directed to take immediate action regarding disseminating the complete information in respect of departure time table of routes operated from different parts of Delhi. The buses will be ply from Uttam Nagar to Nehru Place Terminal and Sarai Kale Khan; Dwarka More Metro Station to Nehru Place Terminal, Inderpuri to Delhi Cantonment, Sector 22 Rohini to Connaught Place, A.N. Terminal to Rajendra Place, Shahdra to R.K. Puram, Madhu Vihar Dwarka to CGO Complex and Kapashera Border to Mori Gate Terminal. Otherwise, life for these hapless widows has revolved around "Radhe Radhe" in the holy place Vrindavan. They are just left to survive on a pittance through religious recitals in temples apart from begging. With pension coverage still a far cry, the tales of many such as Sarathi Mazumdar, accompanied by seven others from her Leela Kunj Ashram to Delhi, stood testimonies to their grim realities in Vrindavan. "I was 12 when I was married and after seven years my husband died. Neglected by own people, I went to Vrindavan when I came to know that we get food there for singing bhajans," said Sarathi, who was widowed 40 years ago and forced to leave her home for livelihood while her grown-up children live in 24 Parghanas, West Bengal. "We sing bhajans and have our meals at temples. Life has been going on somehow, but our basic needs of health are not met," said Geeta Das as she waited for her turn to get a gift of shawl. Many of them are putting up at the five government-run shelter homes-Ashraya Sadans. Others are staying in nearby shelters on rent. Being economically deprived, they are compelled to compromise with their simple wants. In this regard, in line with the apex court's directives, Sulabh has assured the court of providing adequate medical care to the widows and supplied five mini-ambulances for them today. "We have started giving Rs 1,000 per month to each widow living in the government-run shelters in Vrindavan. We have also opened a centre for healthcare and the last rites. We have also handed over certain medical equipment, TV sets and a refrigerator to them," said Sulabh founder Dr Bindeshwar Pathak. One such person is Major-General Ian Cardozo who will lead a group of war-disabled officers and soldiers in the Half Marathon. Major-General Ian Cardozo, who lost his left leg during the 1971 India-Pakistan War and sports an artificial leg, will participate in the Airtel Delhi Half Marathon for the second time, along with other soldiers from the War Wounded Organization (WWO). All the soldiers will be participating in the mainstream category and not in the disabled one with a view to making people aware of the efforts taken by the armed forces to protect the country. Similarly Devender Pal Singh, a retired soldier who lost his leg in Kargil War, will be participating in the Airtel Delhi Half Marathon, which is scheduled on September 30. He is referred to as India's version of the 'Blade Runner'. Major Devender's journey from being a soldier during the Kargil War to a marathon runner has been highly inspiring. A. Vaidhyanathan, the Asia's first and only Indian triathlon athlete, trained in India, is also one of the special participants of the event. Hailing from Tamil Nadu, she acquired a PhD in Electrical Engineering, setting a department and university record with a graduating time of 26 months. Vaidhyanathan is the only Asian to compete in Ultraman distance events in 2009. On what prompted her to take up triathalon as a sport and how has been her journey like? Vaidhyanathan said, "It started gradually. I used to cycle to my school in Bangalore and swim to beat the heat. I took up triathalon seriously when I moved to the US. It has been an exciting journey and my family has been my support system throughout." Ashish Roy who served the Indian Air Force for 21 years is the first man from India to run 100 marathons. He ran his first marathon at the age of 52. "I took to long distance running after I retired from the Indian Air Force where I served as a cardiologist for 21 years. For some running marathons is just another way, but for me, it is a romance with life," said Dr Roy. Three taxi drivers Satnam, Sonu and Satish around 10.40 am found that a foreign national came to the parking lot, kept a bag and was leaving the place. They followed him and then caught hold of him. After getting unsatisfactory reply from him, the taxi drivers informed the police. Following which, panic gripped the whole area and people were vacated and fire and bomb disposal squad was called in. After verifying the bag, the police found that there were some papers, a box and black dollars. "There were no explosive items in the bag and the papers are being verified. Meanwhile, we have detained the foreigner, who claimed himself as Martin from Nigeria. We have to verify the credentials of this man as he has not shown his passport," said SK Jain, Deputy Commissioner of Police (crime and railways). However, the investigating official said that he looked like a member of a "black dollar" racket, which cheats people on the pretext of giving money as lottery. Officials of the special cell, Delhi police, have busted an international drugs ring and apprehended two drug traffickers. They seized 8 kg heroin worth Rs 20 crore in the international market. Information was received that heroin was being smuggled into India from across the Indo-Pak border and brought for sale in Delhi as well as in Mumbai. On September 9, information was received that a trafficker will come at Pankha Road, West Delhi, to receive a consignment of heroin. A trap was laid and a Nigerian national and an Indian were apprehended. They were identified as Theophilus (29), a Nigerian national who lives in Raghu Nagar, West Delhi, and Gurpreet, alias Gullu (24) from Guru Nanak Nagar, Tilak Nagar. A case under the appropriate section of the NDPS Act has been registered. It was revealed that Theophilus had come to Delhi in 2008 on a business visa. In 2009, he came in contact with an international drug mafia having their links in Afghanistan, Pakistan, Punjab, Delhi and Mumbai. According to him, he operated on the instructions of his Nigerian counterpart based in Pakistan. Sunil Kumar, a native of Kanpur in Uttar Pradesh, was found hanging inside the tourist bus around 6 am, said senior police officials. Kumar was found hanging from the hand bar of the bus. The body has been sent to a government hospital for postmortem. There were no external injury marks on the body. The police has informed Kumar's family that will arrive in the city by Friday morning. "We came to know about the incident after the driver of the bus called the police control room," said a police officer. Wednesday night before going home. Kumar had stayed back in the bus to guard it. "No suicide note has been found. We are questioning the bus driver and Kumar's friends to ascertain if he was in depression," said the senior officer. The victim has been identified as Sandeep Kumar of Suraj Vihar in Kakrola. Three labourers travelling in the sand-laden truck also sustained minor injuries. The driver of the truck fled the spot. 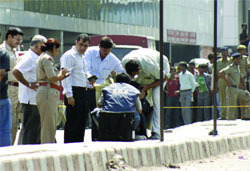 According to a senior police official, the accident took place in Dwarka Sector 22 around 12.05 am. "We received a call that a truck had overturned near Janki Chowk. We were also informed that a motorcyclist was stuck under it," the official added. Personnel of the Dwarka Sector 23 police station and Dwarka Sector 6 fire station immediately launched a rescue operation. "Sandeep's head was crushed despite helmet and he died on the spot. He was identified through his driving licence," the official added. His body was taken to DDU Hospital and was handed over to his family after post-mortem. The injured labourers have been identified as Mahesh, Gulab Das and Madhuram, all hailing from the Samastipur district of Bihar. "They were discharged after first aid. They could say anything about the truck driver," the official said. A case of rash driving and causing death by negligence has been registered against the truck driver with the Dwarka Sector 23 police station. The police has claimed to have recovered five stolen Innova cars, six mobile phones and 30 sedative tablets from their possession. The accused have been identified as Madan Lal and his brother Ashok Arora.